The large, horizontally slit eyes of this statuette have earned it the name of “Snow Goggle Dogu” as their shape is reminiscent of the eye protections used by the Inuit against reflected sun on snow. According to another interpretation, they represent closed eyelids, linking the Dogu to the world of the dead. The head has an ornamental crown of hair, while the nose is a mere hole located between two eyes without eyebrows. Two relief bands representing necklaces encircle the neck. The harmoniously curved torso with wide hips and shoulders extends into two arms and is decorated with a sinuous network of corded marks embellished by rows of dots. 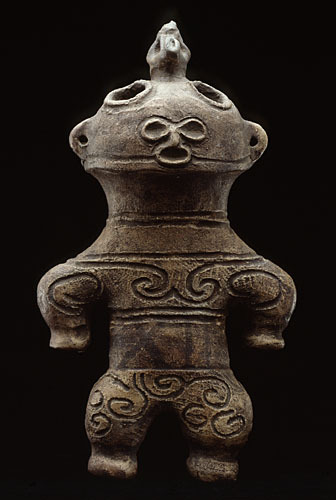 The tiny proportions of the hands and feet again characterize this type of Dogu, essentially restricted to female figures. Dating from the very late Jomon period, they have been most commonly found in northern regions, mainly Tohoku and Kanto in Aomori prefecture. Such Dogu, or “Clay Dolls”, were fired at low temperature (800°C) and are hollow. Their exact ceremonial purpose is still not clear. They are usually found in tombs near villages, sometimes deliberately broken and scattered, perhaps with some prophylactic aim in mind. Their female shapes also link them to fertility cults; they were associated with shamanistic practice, acting as intermediaries between the terrestrial and supernatural worlds. In the following Yayoi period (300 BCE-300 CE) this type of statuette totally disappeared. Along with cord-marked pottery they were one of the most typical Jomon art forms.